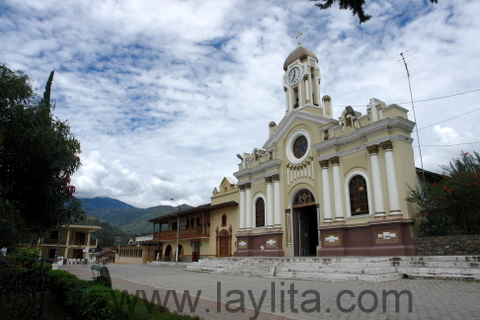 I grew up in the province of Loja, as a child I spent most of my time in the town of Vilcabamba, about an hour away from the city of Loja, though when I was older I attended high school in the city of Loja (capital of the province of Loja). 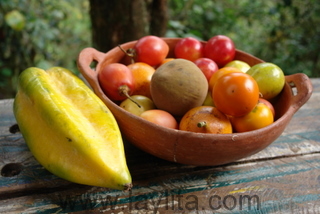 Ecuador has many great places: Quito, Guayaquil, Cuenca, Salinas, Machala, Ambato, Ibarra, Manabi, the Galapagos, etc; however, I am biased towards both Vilcabamba and Loja, they are very special to me: the people and the food I grew up with in these places will always have an influence on my life. There’s a song from the music band Pueblo Nuevo that says “If you’ve never been to Loja, you really don’t know my country”. 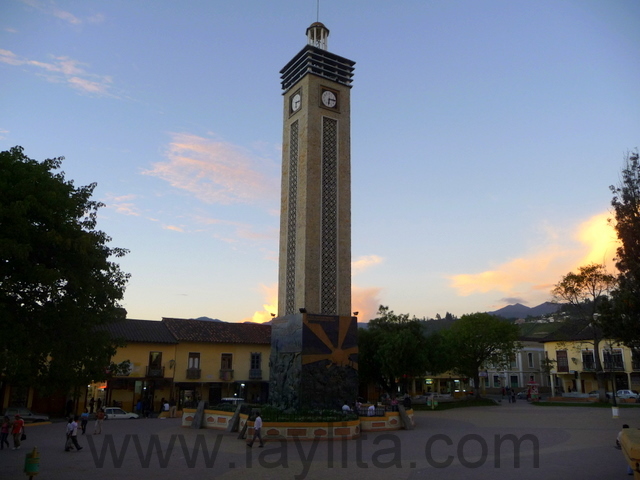 Loja is very laid-back city and is very walkable, it doesn’t have any major landmarks like Quito does, but has a lot of charm, people are friendly, and of course, the food is good. 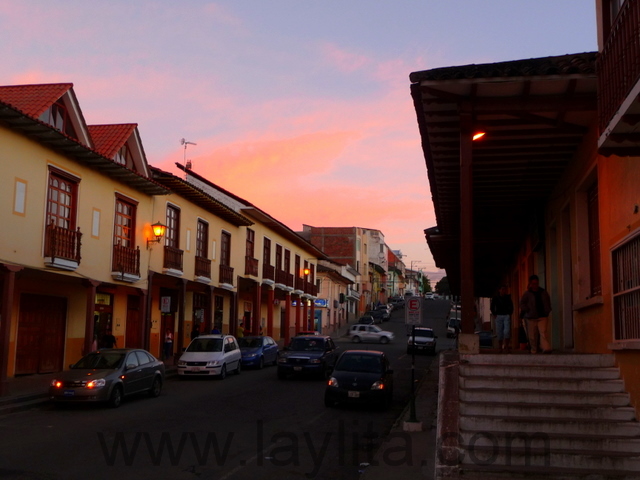 Loja is known for its cultural and musical talent, some of the best writers and musicians are from this city. The main sights in the city include the central park and the cathedral, the plaza Santo Domingo and San Francisco are a block away. My favorite plaza is San Sebastian, you have some of prettiest streets around this area, including Lourdes street, which has had a lot of its colonial charm restored. You also have several food markets in the city, including the Mercado Mayorista which is more on the outskirts of the city, and the old market in the main central area; there is also a small market in the San Sebastian plaza. I also recommend visiting la Puerta de la Ciudad or the entrance gates of the ciy and Jipiro, a park with replicas of many places in the world. I’ll post more about Vilcabamba later, but it is definitely a place to visit, a beautiful valley with great weather that is weekend resort destination for locals and very popular place for tourists. 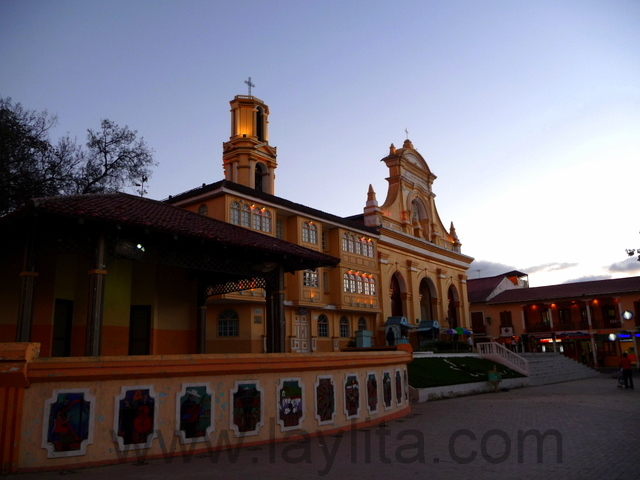 The Loja airport is located in the town of Catamayo , also known as Latoma, which is about 45 minutes away from the city. 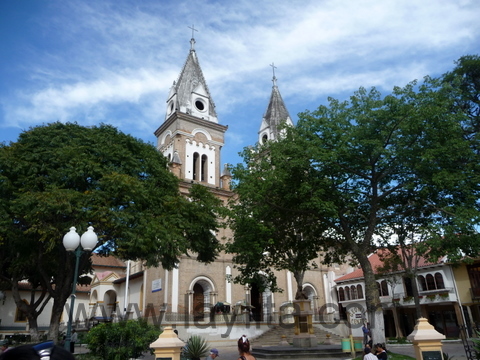 Latoma has a warmer, almost tropical, climate than Loja and is one of the places that locals go to on the weekends to get away from the city. Most people who fly in to the airport skip Catamayo – thinking there is nothing to see besides sugar cane – and take a taxi directly to Loja, however if you love food, especially if you love pork, I highly recommend that you have lunch in the town and that you try a local specialty called Cecina de Chancho, thin pork steaks that are marinated, air dried and then fried. Cecina is served with fresh boiled yucas, onion and tomato curtido and aji or hot sauce . 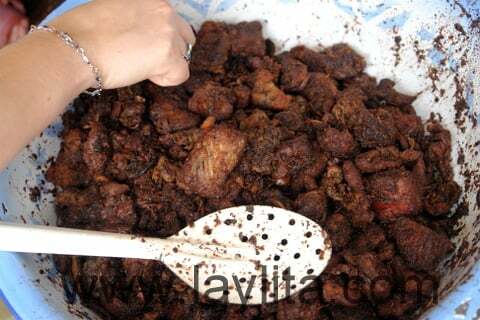 You can find cecina de chancho all over the province of Loja, but the ones in Catamayo are known to be the best. 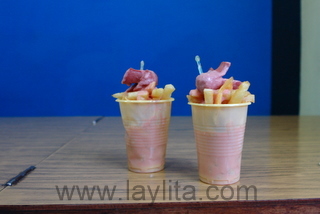 The first food related to-do item on my mind when I actually arrive in the city of Loja is to go to small hole in the wall place called Soda Bar that specializes in Salchipapas or French fries with hot dog sausages. 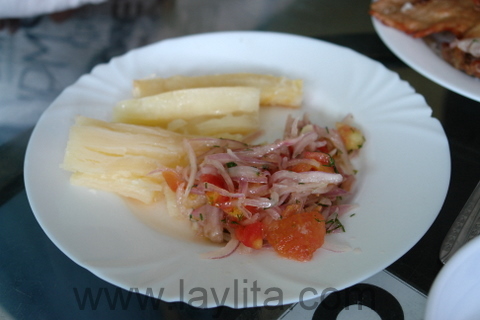 Sure, you can find salchipapas anywhere in Ecuador, but these have the best and most addictive sauce that you will ever taste; everyone I know that is from Loja will likely agree that going to eat salchipapas at the Soda Bar is top priority. 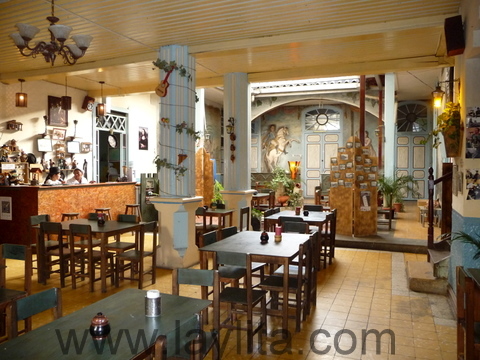 Another must eat at place is a restaurant/bar called La Siembra, this place has also been around forever and has also changed locations but has the best pinchos or kebabs as well as great live music on the weekends. 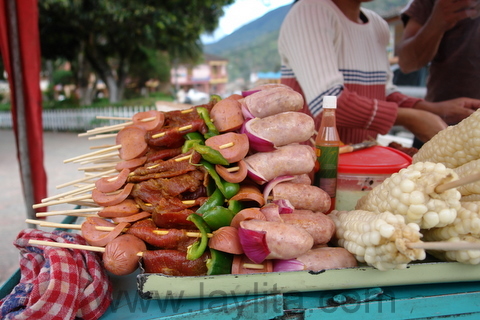 Loja has great street food, especially during any of the local holidays. In September, there is the feria or fair, which starts when the Virgen del Cisne is brought from the town of El Cisne into the city of Loja. In November, you have the Day of the Deceased and return of the Virgen del Cisne to her hometown at the beginning of the month. On November 18th, we celebrate the independence of Loja; this involves a civic parade where all the local high school students participate. On December 8th, we celebrate the foundation of Loja and there is also a small fair that lasts until Christmas. You can find street food carts throughout the year, but they are everywhere during the local holiday celebrations. 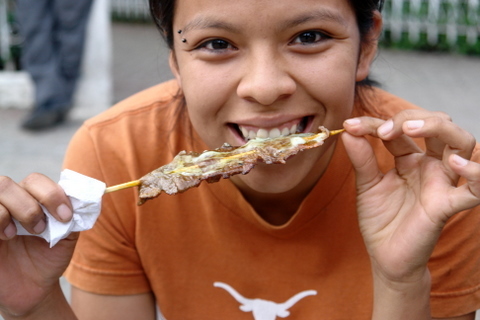 Some of my favorite street food include the carne en palito or meat on a stick, choclo asado or roasted corn, huevitos chilenos or deep fried sweet pastries – these are somewhat like donut holes but so much better, chifles or green banana chips, and chicharrones or deep fried pork belly. 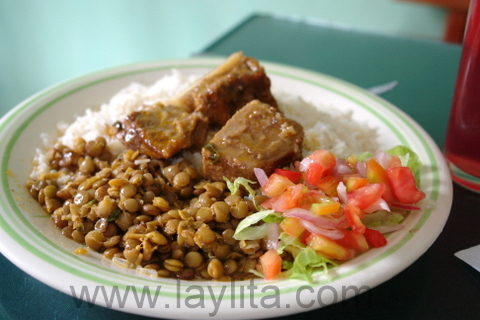 Lunch or almuerzo is the main meal of the day in Loja, most restaurants have fixed lunch menus where for under $5 you will get a warm bowl of delicious soup, a main course consisting of your choice of protein: carne frita or fried meat (pork or beaf), estofado de carne o de pollo – a dry stew type dish made with beef, pork or chicken; served with rice, a small salad and either lentils, beans, yuca or potatoes. You will also get a drink and sometimes a small dessert or piece of fruit. 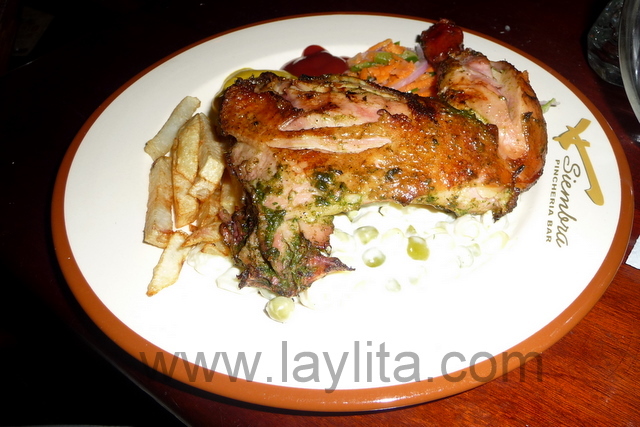 Some of the main dishes that are very typical in Loja include fritada or slow braised pork, gallina asada or roasted chicken, cuy asado or roasted guinea pig, pernil lojano or roasted pork loin, estofados or stews. 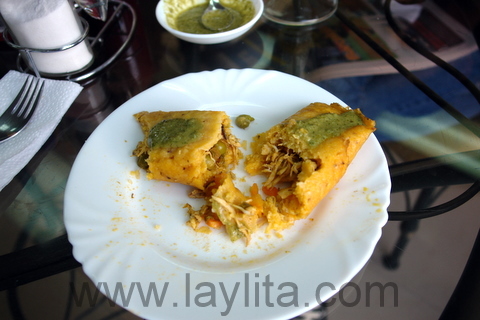 Loja is also famous for its tamales, these are very different than the Mexican tamales, they are larger, have a much better condumio or filling, and are wrapped in leaves from a planta called achira – arrowroot or canna. They are typically eaten for breakfast or with afternoon coffee and served with traditional local hot sauce called aji de pepa, which is made from pumpkin or squash seeds. 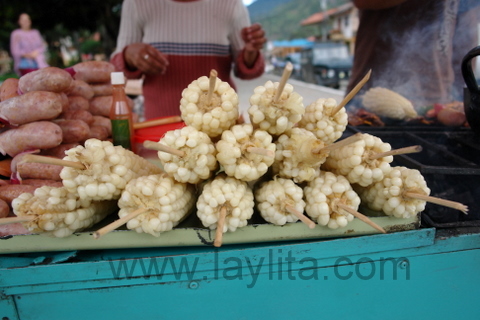 One of the typical soups in Loja is called repe, it’s a creamy soups made from green bananas and is really good. Another variation, I like to call it a cousin, of this soup called arvejas con guineo or peas with green bananas, it’s very similar but includes peas. 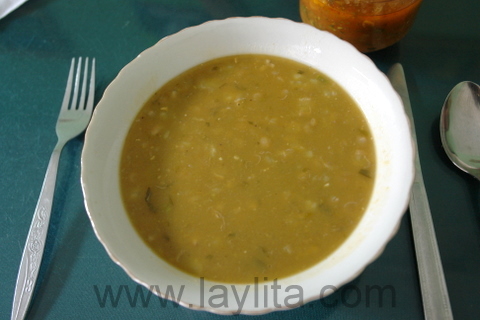 Another soup from Loja that I really like is sopa de cebada con papas or barley and potato soup. Soups are usually served with avocado slices and hot sauce. 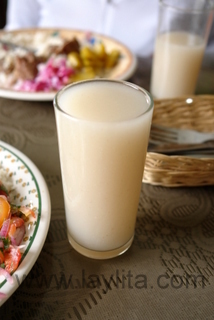 The most common drink served with almuerzos are usually called frescos and are watered down fruit juices (think Mexican agua frescas), but you are also likely to encounter an aromatic herbal drink called horchata (think very different than Mexican/Spanish horchata). 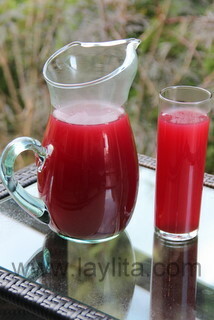 Another common type of drink are chichas, slightly fermented fruit or grain drinks, some of these include corn chicha, pineapple chicha, cococut chicha, rice chicha. 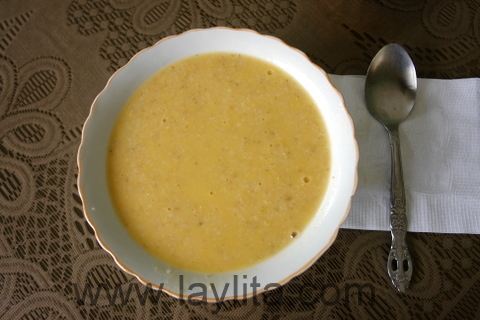 Colada de avena is a drink made from oatmeal and a local fruit called naranjilla. Freshly made fruit juices are amazing drink choices, though sometimes you’ll pay extra for these, some of the best include passion fruit, tree tomato, naranjilla, mora or blackberry, granadilla. 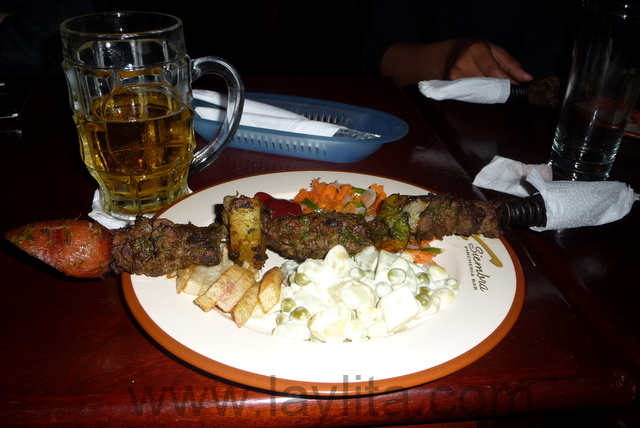 If you are looking for something stronger, but not too strong, then try an Ecuadorian beer with your meal. 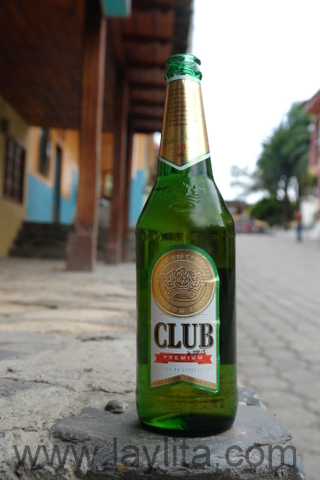 The most popular are Club-sometimes called Verdes- and Pilsener, these are very light flavored beer, so if you’re expecting a stronger flavor beer you might be disappointed. Guitig is Ecuador’s sparkling mineral water; it is so well known that everyone calls any type of sparkling water by that name. 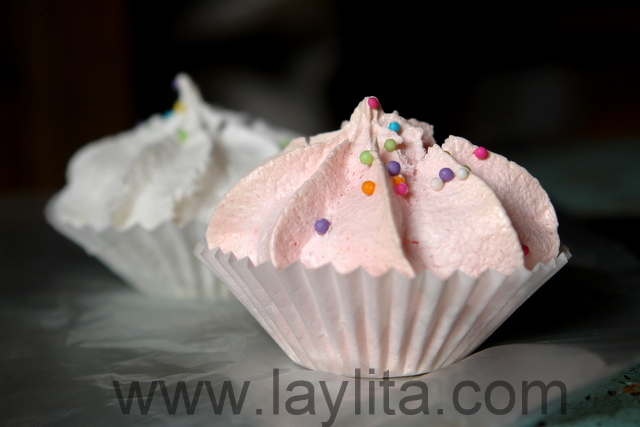 Desserts are not always served with meals, but rather as snacks or with breakfast or afternoon coffee, you will find a large selection of specialty sweets in Loja. 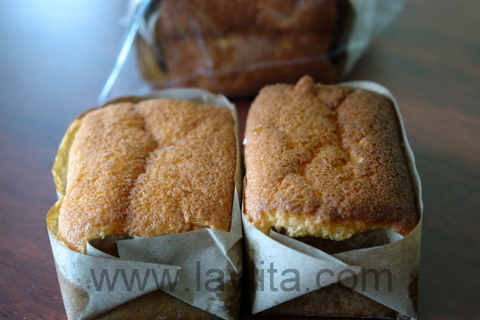 Some of my favorites include biscochuelos – a type of sponge cake, which goes great with coffee. 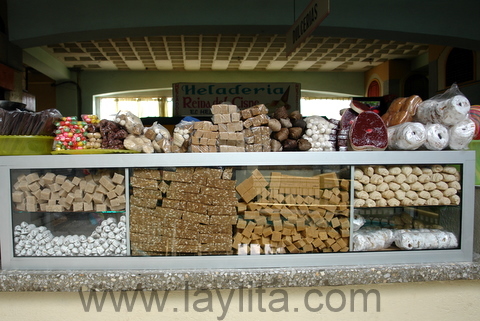 You will find the best biscochuelos in a small town called Malacatos, about 30 minutes away from Loja, when I was growing up we would always stop there to pick some up. 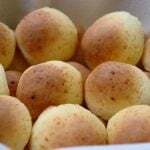 Even if you were on a bus, the driver would actually make a stop so that people could buy biscochuelos in Malacatos. They also used to use the oval sardine tins as the baking molds for these, though now they use regular small rectangle shaped baking tins – but I miss the old shape. Another traditional sweet are cookies called quesadillas lojanas (do not confuse with Mexican quesadillas). 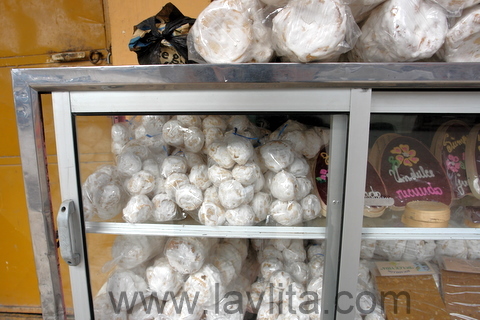 In most bakeries you will also find roscones, they look like puffed up donuts, but are crunchy instead of soft. 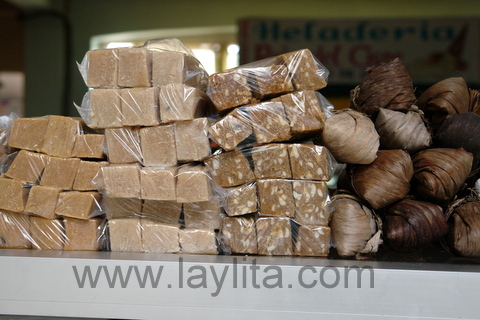 Melcochas or alfeñiques are a type of pulled toffee candy made from panela or raw sugar. 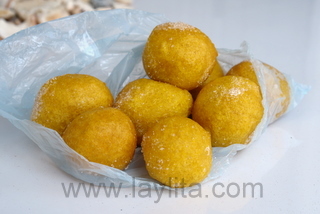 Bocadillos are small soft square sweet candies that are made from panela and ground peanuts. You can also find dulce de guayaba or guava paste sweets, dulce de higos o candied figs in syrup, quesillo con miel or fresh cheese drizzled with panela syrup, espumillas, and suspiros or meringues. Finally, the local fruit by itself makes for a great dessert, try a slice of babaco drizzled with honey and you will be in heaven. 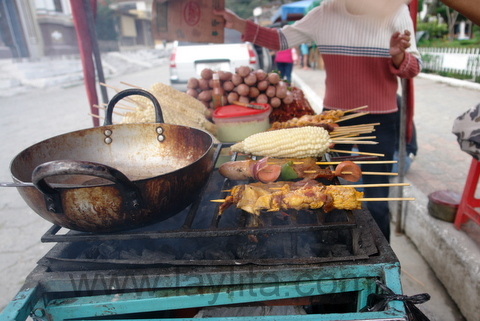 I hope you enjoyed this brief tour of the typical food dishes from Loja, I’ve probably left out many great dishes and things to eat in Loja. Feel free to add your own suggestions to the comments. 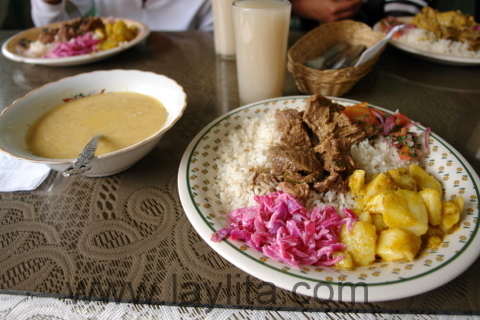 I’ll also add that some of these dishes are also very popular in many other cities in Ecuador, especially the ones in the Sierra or Highlands, but some like the tamales lojanos, repe, horchata, bocadillos are very unique to Loja. Me encanta cocinar con sus recetas. Muchas gracias por compartir todas esas recetas y fotos hermosas. 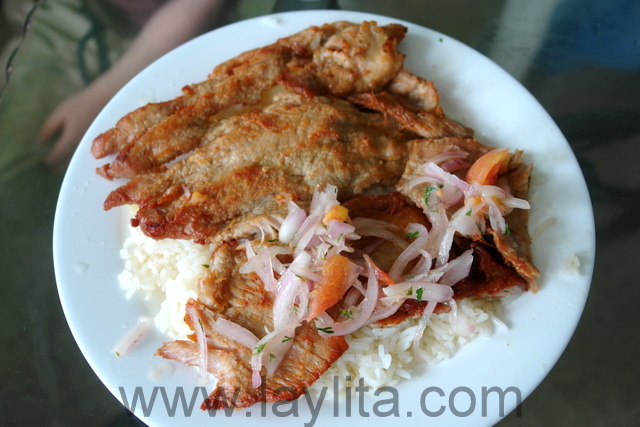 Soy de Ecuador pero vivo en USA, es muy difícil encontrar restaurantes latinos en el área donde yo vivo, hay muy pocos pero ninguno es ecuatoriano y a mí me encanta comer los platos criollos de Ecuador. Lo que no he podido encontrar entre sus recetas es la receta del tamal lojano; hay mención del tamal lojano en su pagina pero no la receta. Me imagino que usted tendrá la mejor receta de este tamal. ¿Podría, por favor, poner la receta en su colección de recetas ecuatorianas en su página de la Web? Le agradecería muchísimo. Thank you for this great page. 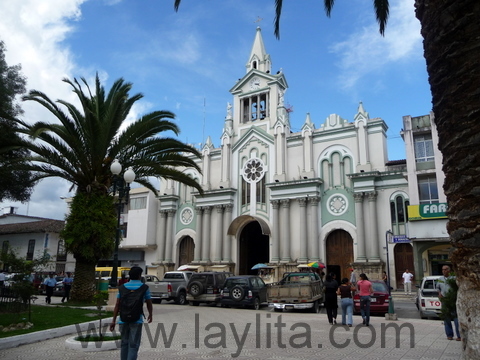 I’m from Loja but this year I’m living in USA but I hope to eat something from my adorable city LOJA! Soy quiteña de madre lojana, Por Lo Tanto soy criada con la comida lojana que para mi su gadtronomia es Lo mejor, mi madre nacio en la parte que parece ser tropical latoma, me encanta esta sopa “repe” y sus kimbolitos, tamales e humas. Loja es muy hermoso! 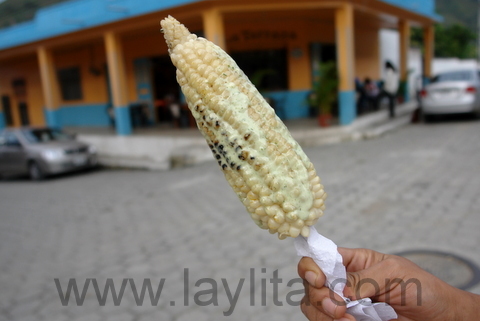 Que hermosa mi bella ciudad de Loja y que deliciosas comidas y golosinas yo siempre viajo cada ano , hermosas fotos gracias por mostrarle al mundo nuestra cultura. Hola yo al igual que tu pase mi niñes en Vilcabamba ahora me encuentro en España me alegra mucho haber encontrado tu pagina me gusta mucho ya que habla de nuestras tradiciones y especialmente de la comida . tus recetas estan muy guay y sobre todo me encantan las fotos que pones para cada paso solo con verlas se me hace aguita la boca . 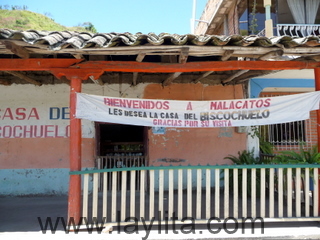 Naci y creci en Loja, todos los fines de semana soliamos ir a Vilcabamba, a Malacatos y algunas veces a La Toma; asi que todo lo que tu dices es tan cierto y revivi cada uno de los momentos , extraño los tamales a media tarde con un rico cafe en casa de mi mami, las mas ricas salchipapas del planeta que soliamos ir a dizfrutar con mis amigas a la salida del colegio, la cecina y helados de coco que no podiamos perdernos cuando estabamos en la Toma, recorde la casita en donde comprabamos los biscochuelos hechos en molde de cajita de sardina, y por supuesto la alberja con guineo que muy de vez en cuando puedo hacerla (no encuentro con facilidad los guineos verdes) Actualmente vivo en pensylvania y comparto los fines de semana con algunos amigos lojanos, siempre que nos reunimos revivimos muchos gratos momentos vividos en nuestra querida y hermosa Loja. Gracias por tus recetas…. Laylita I want to thank you for writing the most amazing blog I have read, you couldn’t have explain what Loja is in better words. You brought me back to the most magical place I have ever known. It’s funny how every place you mentioned is every place i hope to go back to someday. You have truly brought back many wonderful memories. Laylita, I want to say thank you for bringing back wonderful memories. I have visited Ecuador many times due to a personal situation. My husband is from Loja, and I simply love it there. The people and the food are great. I recognize the places in your pictures and the taste of the food in the pictures as well. I have not been to Loja in about 5 years. I can’t wait to visit once again. Again, thank you so much! What a wonderful post about Loja. I was born in the city of Loja, but grew up mainly in La Toma aka Catamayo at my family’s hacienda very near the Ingenio Monterrey. When I was 9 we moved to Quito but spent all our summers in Monterrey in La Toma. I now live in Miami, Florida. I LOVE your blog. Thank you for sharing these delicious recipes. 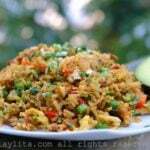 I now can introduce my husband, son and friends to our delicious Ecuadorian food. Believe it or not, I had not a clue on how to make many of my country’s dishes, except for a few like menestra, sopa de lentejas, mote pillo, and a very few others. 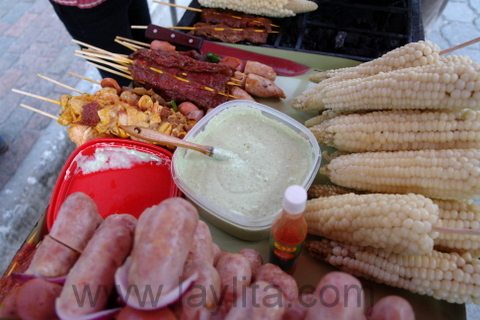 I hope you’ve possted the recipe for tamales con aji de pepas, repe, porotos con guineo…. :-) I’m going to make so many of your recipes. 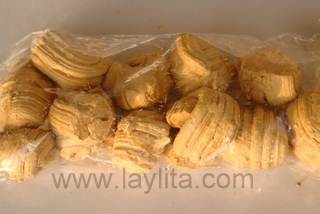 I’ll make llapingachos today, can’t wait! 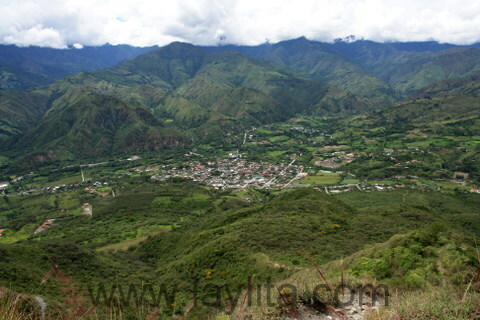 I was born in Loja, lived in Quito and my summers were spent in the paradisaical Vilcabamba. I now live in Washington D.C with my husband and daughter. Your website brings back memories, flavors and wonderful recipes that have made me want to start making them and sharing them with friends and family. Mu grandmother was from Loja- I never visited but after 25+ years in the States is time to go back and have a taste of all the food there. Love your blog!!! and now I;m HUNGRY!!!! Ojala algun dia podamos conversar Layita. Me encanta tu pagina y me encanta compartirla con mis amigos que como yo no estan en Ecuador, o con la familia de mi esposo que se encanta al saber mas cosas de mi pais. Entre la nostalgia, la posibilidad de cocinar y compartir lo nuestro, y estas fotos. Solamente gracias! Es una linda pagina. Gracias por compartirla!